← Quick Questions: What Word Bothers You in Comedy? I was googling Louis CK to find photos to run with my Louie recaps and I found one from LA comedy scene photographer Leizl Estipona. Well, I e-mailed her to see if she had any others that had more than just my arm in it and she managed to find two more! Here’s the story behind the first one. Jonah Ray was hosting the Comedy Bang Bang show at the UCB Theatre in Los Angeles. He introduced me by saying that I open for Marc Maron all the time. I was worried because I think I said that he and I have only worked together once…well…twice if you count this night. I didn’t want Marc to freak. So this picture is in the middle of me telling Jonah on stage, “I didn’t say all the time!” Sure enough, Jonah went backstage and Marc corrected him. Jonah laughed and told Marc that I told him that was going to happen. When I went backstage, I mentioned it to Marc too who told me that he and Jonah already discussed it! Ah….the silliness the ensues in the green room! This next picture is a pretty momentous occasion for comedy nerds. Maron and CK used to be like best friends. As things in comedy go, that relationship changed over years. 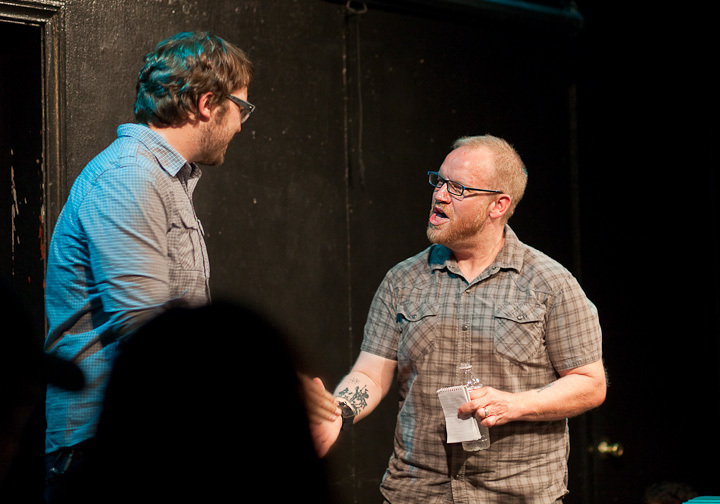 This night at UCB may have been the first time they’ve seen each other socially in years. Louis did Maron’s WTF podcast, but this could very well be their first time bumping into each other in a club setting. Marc seemed so excited when it walked into the green room and Louis was sitting there. It was really exciting to experience first hand! So there you go! Thank you Leizl for finding those for me. She does incredibly great and rare photography of the LA scene. She gets access to areas most of us dream about. Check out more of her simply amazing work on her site! Posted on August 12, 2011, in More Misadventures! and tagged Comedian, comedy, comedy bang bang, jonah ray, leizl estipona, louis ck, Marc Maron, mike bobbitt, off the mike, ucb theatre. Bookmark the permalink. 1 Comment. I love this like a mutherfucker! But not more than you.